1. Stable in quality and cost raw materials for the production of alcohol products - wine from its own grapes. 2. Provision of own wine material - 87 million bottles of alcoholic beverages. 3. Own resource base allows to apply various modern technologies One of the largest wineries in Russia for the production of quiet and sparkling wines was created back in 1956, and in 2003, it became part of the "Ariant" group of wine companies. The winery operates on the principle of a full cycle production: the berries harvested from their own vineyards are processed directly from the vines. Today, Kuban-Vino has three production sites of their own, 56 million bottles of quiet and sparkling wines per year and more than 12,000 hectares of land located on the Taman Peninsula and in Anapa District. Unprecedented scale even for European winemaking! However, the secret of success of the winery is not only in the scale, but also in the approach to production: it is a modern, technological, and even science intensive process. The newest European equipment, the best specialists, educated and trained in Europe, perfected technology of each link in the production chain - all this allows creating worthy, high-quality wines that are appreciated by professionals not only in Russia but also abroad. Today, the company's portfolio includes four main brands: ChateauTamagne, ARISTOV, Kuban-Vino and Vysoky Bereg. The products of "Kuban-Vino" have earned the confidence of consumers and high ratings of experts. From 2009 to 2018 the winery was awarded more than 500 medals and awards at Russian and international competitions. 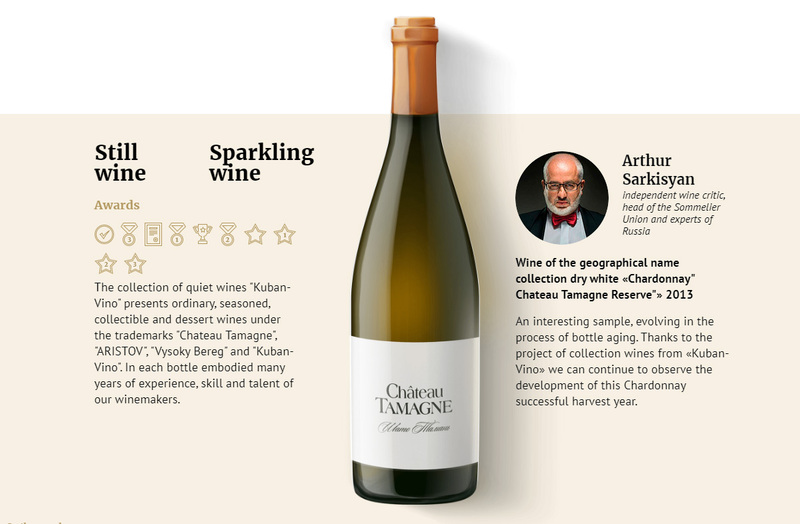 The most famous, "fundamental" brand of the winery is the premium trademark Chateau Tamagne. Monosort wines of this brand are a reflection of centuries of traditions and a classic interpretation of varietal features. Assembling wines are an ingenious, original, innovative approach to creating wine. In the technology of creating sparkling wines, the traditions of French winemaking and the modern methods of Russian winemakers were combined. Since 2015, "Kuban-Vino" has been cooperating with enologist-consultants of Enofly (Italy), which allows using the experience and traditions of Italian winemaking to create new lines. So, as a result of joint work, already in 2015, the trademark "ARISTOV" appeared, named in honor of one of the two founders of the "Ariant" holding. Another new brand was added to the collection of the winery in the summer of 2017: wines were produced under the trademark "Vysoky Bereg", each wine of this series was certified according to the ecological criteria "EcoTestPlus". Such certificates for the winery products were received for the first time. In the development of viticulture, an important step was taken in 2017 with the opening of the "Southern" nursery of grape seedlings on the basis of the Agrofirma JSC. A unique kennel was created not only for the region, but also for the whole of Russia within the framework of the Presidential program for the development of Russian viticulture and winemaking, as well as the implementation of the line of the Government of the Russian Federation for the policy of import substitution. Today, the capacity of the nursery is 4 million seedlings per year. A new landmark in the history of the winery "Kuban-Vino" was November 16, 2017, when in the Vinogradny village of Anapa district, the first stone of the Center for Enology and Tourism and the new winery of the wine group of companies "Ariant" was laid. The innovative factory will be built on the site of the legendary Order-bearing Agricultural Production Cooperative named after V.I. Lenin, founded in 1933, the largest winemaking enterprise of the country of the times of the USSR. To design the future plant for the production of champagne and sparkling wines of the full cycle, the best specialists from Italy and France were brought in. The new production site will perform the full range of tasks for processing grapes, champagnization, bottling, packaging, storage and sale.